Inspired by the mythological and the unknown, ‘Galaxias’ features two stunning designs with the rearrangement of leaves. The first design is a circular branch of diamond- embellished leaves, conjuring the image of the laurel wreath, crowned for victors and champions. Worn by the sun god, Apollo, in Greek mythology, the laurel wreath is an honourable and triumphant symbol. The leaves in this particular design spread outward from the bottom, then meeting at the top, forming a circle of brilliant diamonds. The second design features brilliant diamonds with an outward spiral from a centre point, recalling the unfathomable Milky Way galaxy. Spreading outward from the centre in a clockwork fashion, the diamond-embellished leaves form a galaxy jewellery, eliciting cosmic vastness. The elegant ‘Dancing Star’ is a precisely designed product with worldwide patent. 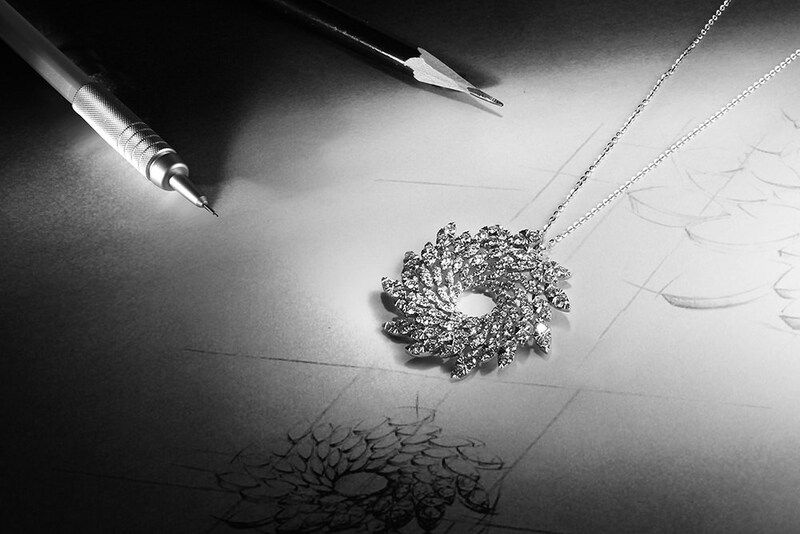 This stunning jewellery is a product of pioneering craftsmanship and a scintillating collaboration with the famous ‘Snowflake’ collection. The ‘Dancing Star’ is an illustration of fluid movement and grace. It features a beautiful design with small diamonds along its spiral, which shelters the leading star of the show, a brilliant diamond at its core. The combination of a Japanese shaking technology with the ‘Snowflake’ collection has produced an exquisite jewellery exhibiting a revolutionary design that allows the focal diamond to balance freely and with minimal support.